According to ESPN's Zach Lowe, Danny Ainge may have offered a package involving Boston's best future draft picks in an attempt to acquire San Antonio's Kawhi Leonard. The draft picks mentioned were most likely the Kings, Grizzlies and Clippers picks that the Celtics acquired from the three teams. "Rebuilding was just not going to be an option there," said Zach Lowe on his podcast. "They want to remain 'relevant', I think is the word that has been used. They want to remain in the playoff race. They just weren't going to consider offers that were heavy on draft picks and young players. 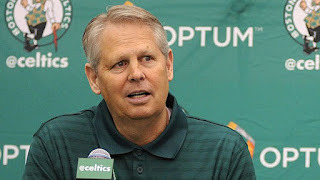 "And by the way, as all the reporting from this sort of trickled in, I think the Celtics offered most of their best draft picks. I don't think the Celtics just offered (and said) 'You could have a bunch of our picks.' I think some of the picks they're owed, at least two of the picks, if not all of them that they own from other teams, including the Kings, Grizzlies and Clippers. I think those were all in the deal. "And the Spurs were like 'Nah, we don't want that.'"